The party just doesn’t stop at Dauphin’s Countryfest. No matter the day, the time or the weather, those looking for a good time need not look any further than Canada’s longest running country music festival. 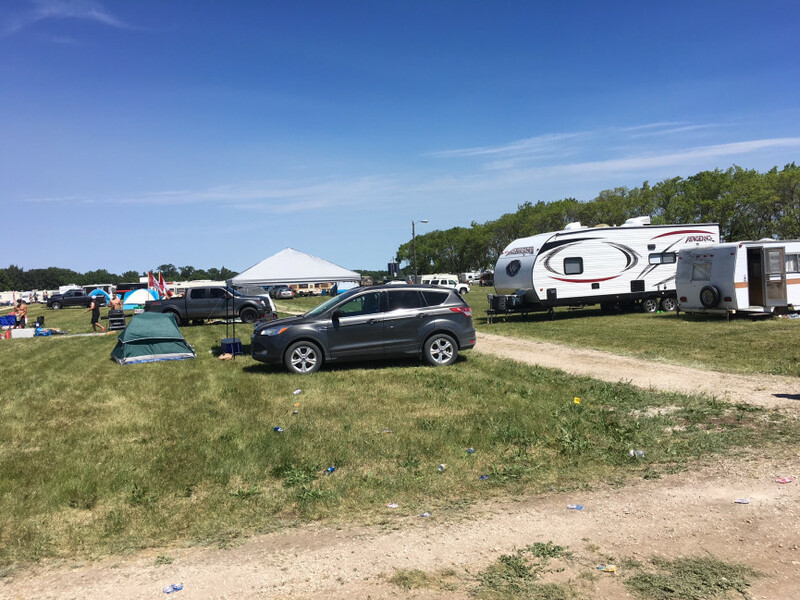 With the front gates officially opening up for business Wednesday afternoon, country music enthusiasts and summer partiers alike have now been situated in Dauphin, MB. for the past four days, enjoying the music, friendship, activities, food and beverages, all from the comfort of their tents and trailers. Although the music at the 29th running of Countryfest has once again been top notch, the weather has been a struggle for most campers. With flooded tents, muddy sites and soaked clothing, the weekend has provided a less than ideal overall climate. The rain may have turned the campsites into miniature ponds, but the party is still going strong in Manitoba’s northwest. Following a beautiful Wednesday and Thursday, the skies opened up on Friday, providing a horrific downpour that pounded through most tents on site, even bestowing rain damage to the strongest of trailers. The James Barker Band had their early evening concert cancelled, so the group decided to put together a miniature acoustic set on the Club Regent Casino Main Stage front. A general stagehand doubled as a microphone stand for the duration of the performance. JBB was to open for Dallas Smith, who was to open for Florida Georgia Line – the ‘main event’ of the weekend for most in attendance. Countryfest rookie Harley Bray offered a similar scouting report to that of Torfason. Florida Georgia Line – six time Vocal Duo of the Year – also entered their Friday night performance under the watchful eye of Thompson, MB. resident Camryn Turton, who made it clear the talented twosome would be the highlight of her weekend. Following the James Barker Band’s set early Friday night, Cfest regular Dallas Smith hopped up next and turned it up to 11 with his rock and roll country hits. The former Default frontman paved the way for Florida Georgia Line – who made their return to Countryfest following their debut in 2013. As was the case with the Dallas Smith show, Florida Georgia Line performed under a steady downpour. The sheets of rain eased up at times, but the show went on. Keeping the crowd swaying and jumping to the music, FGL put together a conglomeration of old and new, with nostalgic originals, ‘Holy’, ‘Dirt’, and ‘Stay’, before cranking up new hits ‘Meant to Be’, ‘Colorado’, and ‘Simple’. The southern duo completed their act with the song that brought about their fame, ‘Cruise’. Saturday’s musical lineup began with Midland, before up-and-coming artist Luke Combs made his Countryfest debut. Combs had recently lost his voice and returned just in time for the show in Dauphin. He failed to disappoint with his hits, ‘Beautiful Crazy’, ‘Out There’, ‘Hurricane’ and ‘When It Rains It Pours’. Eric Church closed out yet another jam-packed show as the 41-year-old pulled out all the hits from his 12-year professional music career – yes, all the hits. Dressed in his classic shades and tight fitting pants, his late-night concert, much to the delight of the Manitoba spectators. The party continued Sunday as the clouds and storms held off showers for parts of the day. Sunday’s headliner, Canadian artist Paul Brandt put together a solo acoustic show mid day from the campground between periods of rain in preparation for his evening act. Even as the rains continued throughout the weekend, the party at the southernmost point of Dauphin remained alive and well. Putting the fun into perspective was two lifelong buddies, Anthony Cruz and Tanner Danyluk. No matter who’s performing, where you’re staying, or what you’re drinking, a full glass… err, a full red Solo Cup sure goes a long way in Dauphin, especially on a weekend of weather like this.